I recently spent a Sunday afternoon at the Alabama Theatre, a movie palace built in Birmingham, AL in 1927. Gaslight, a visually stunning black and white film released in 1944, was the movie being shown. Every time I see this movie, especially on a big screen, I notice something different--either in the movie’s sets, the characters’ actions or dialogue. I was anxious to see this movie at the Alabama Theatre because there have been recent, significant updates to the theater’s projection and sound equipment and I wanted to see the difference. The movie was MGM’s digitally re-mastered version and the screening was very good. The picture was clear even in darkened scenes, such as the night scenes in the London fog, and there was no distortion. The sound seemed much better than the last time I saw a film at the Alabama Theatre, also. I saw Gaslight at Grauman’s Chinese Theater in Hollywood at a film festival a couple of years ago and, in comparison, the Alabama Theatre’s screening was just as good. Before the movie began, the audience was entertained with music from the Mighty Wurlitzer organ that rises from the stage floor. The organist played many old favorites such as “You Made Me Love You” and a trio of sing-along tunes. The movie’s setting is 1885 London. Ingrid Bergman plays Paula, a beautiful, young woman who has returned to her childhood home with her new husband, Anthony, played by Charles Boyer. She inherited the home from her aunt, who was a famous opera singer and with whom she lived as a child until the aunt was murdered in the house. Although it has been 10 years, Paula is still affected by this tragedy. She’s sensitive, impressionable and very trusting. Her husband is a composer and, in the beginning, very kind and understanding. It is not long before their idyllic marriage begins to crumble and movie-goers realize that Anthony is up to no good. Anthony tries to isolate Paula, discouraging her to go out or have visitors. He implies it is for her own good because her nerves are affecting her behavior. Ingrid Bergman's character, Paula, examines a mysterious letter she found written by her long-deceased aunt in the movie Gaslight. forgetting things. Her husband hires a maid, Nancy, played by Angela Lansbury. This young woman has a disdainful attitude towards Paula, which further unnerves her. As the situation escalates from accusations of her losing and forgetting things to stealing, Paula becomes even more vulnerable. She hears noises from the vacant floor above. She is frightened by the gaslight that goes from high flame to low and then back to high for no apparent reason. She thinks these things are not actually happening, but are figments of her imagination. As the story gets darker, so does the lighting in the film. Shadows deepen in the exquisite interior of the house filled with dark wood furniture, paintings and decorative items of the time period. 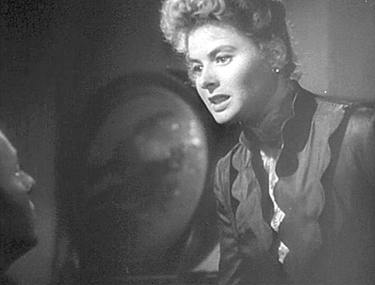 They play across Ingrid Bergman's beautiful, expressive face as she watches the gaslight flame go up and down. Gaslight is one black and white film that wouldn’t be nearly as effective if it were in color. The shadowy scenes add to the suspense and sense of impending doom. Boyer is chilling in his portrayal of Anthony, who is a master of psychological manipulation. On a rare occasion when Paula insists she go to a party at the home of one of her aunt’s friends, Anthony chooses a moment during a pianist’s performance to look at his watch. He tells her he doesn’t have his watch and insists on looking in her handbag. There he finds the watch. Paula starts sobbing, convinced she had stolen the watch and is going insane. This disrupts the party, upsetting the hostess and other guests, including an inspector with Scotland Yard, Brian Cameron, played by Joseph Cotton. Inspector Cameron was an admirer of Paula’s aunt when he was young. He has been observing the couple from afar for a while and suspects something is wrong. He has re-opened the aunt’s murder case and is intent on solving the cold case. This mystery/thriller was up for seven Oscars at the 1944 Academy Awards. Ingrid Bergman won Best Actress. The film won for Best Art Direction in the black and white film category. George Cukor directed the film. Gaslight is part of Alabama Theatre’s Summer Film Series. 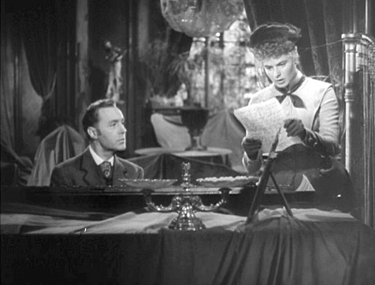 Paula confronts Anthony, her husband played by Charles Boyer, in the final scene of the movie, Gaslight.